The Barlow RC High School wishes to congratulate all students on their amazing 2018 GCSE examination results! The Key Stage 4 curriculum and GCSE examinations have undergone radical national changes over the last two years making them far more challenging. A new numerical grading system of 1 to 9 has been introduced with Grade 9 being the highest grade possible and far fewer Grade 9’s being awarded than A* making it exceedingly challenging to achieve. We are absolutely delighted that well over 50% of all grades achieved this year were at the strong pass level surpassing last year’s results, with 111 grades being at the highest Grades of 8 and 9 and with one student achieving almost a full complement of 8 grade 9’s! An amazing result! This year over 75 % of students achieved at least the standard Grade 4 pass in English and 65% in Maths. Additionally, 100% of students who sat the Triple Science examination achieving an outstanding 100% pass rate with approaching almost 50% of these being awarded at the top grades of 7-9! The amount of work that both students and staff have had to put in this year to meet the challenge of these new examinations has been unprecedented. Our congratulations to all Year 11 students and staff on their success. We are exceptionally proud of all our students and wish them all the very best for their future success. "When I started at The Barlow in Year 8, I was very nervous and shy. Coming from a different country and continent, everything was different and unfamiliar. However, I constantly worked hard and pushed myself to achieve the best possible grades. Opening my GCSE results today has truly shown me how much hard work and perseverance pays off. It demonstrates how much you can achieve with the right mind-set. The teachers at The Barlow have been amazing and have definitely played a huge role in my achievements by giving up so much time and effort in helping me surpass my target grades." Top class results for Chiamaka! We are extremely proud of Chiamaka Anthony-Okeke’s exceptional performance in this year’s GCSE examinations. Despite the increased level of challenge and academic rigour in the new 9-1 curriculum, Chiamaka has surpassed all her targets, achieving a full complement of Grade 9s and one Grade 8 across all her subjects, making her one of the highest achieving students in the country. Well done Chiamaka – this is a truly outstanding achievement and we wish you all the very best for what we know promises to be a very bright and successful future. The Barlow RC High School wishes to congratulate all students on their excellent GCSE results with a record 19% of all students achieving 7-9 grades for English and Maths (the new top grades for these subjects) or grades A*-A for all other subjects. At a time when examinations are becoming more challenging, it is simply inspirational to see our students rise to the challenge and work even harder to achieve and surpass their target grades. The new GCSEs for English, English Literature and Maths are now graded on 1-9, with a 4 or higher being considered to be a ‘standard pass’ or equivalent to a C. 86% of our students achieved a grade 9-4 in English and 63% achieved a grade 9-4 in Maths. A grade 9 in these subjects is intended to be very rare – far more so than A* grades on previous GCSEs – and we are very proud that our students attained 7 of these grades: 5 in English and 2 in Maths, putting their results in the top 2% nationally. We have also seen continued success across the breadth of our curriculum and across our EBacc subjects, with A*-C results of 79% in Geography, 78% in History, 75% in Computer Science and 67% in Spanish. In addition, as a Catholic School where all students study RE to GCSE level, we are delighted at the year-on-year successes of our RE department, with 80% of students achieving A*-C grades and over a third attaining top A*-A grades. Results in many other areas of the curriculum were also excellent, particularly in Separate Science where 98% of students gained A*-C in Chemistry and Physics and 96% in Biology. Additionally, over 30% of these students achieved the top grades of A* and A.
Congratulations to our Year 11 students. We are very proud of them and wish them all the very best for their future success. The Barlow RC High School wishes to congratulate all students on their excellent GCSE results with a record 17% of all students achieving A* – A grades. At a time when examinations are becoming more challenging it is really very encouraging to see our students rise to the challenge and work even harder to achieve and indeed surpass their target grades. This year has seen a number of changes to the examination reporting system. Schools no longer report GCSE results in terms of the old 5 A* – C including English and maths measure. The Government felt that this measure did not provide parents with enough information to identify if their child had made good progress at their school. The new measure being used by schools is called Progress 8 which identifies the progress made by students in their best 8 GCSE examinations. This year The Barlow surpassed its 2015 performance by achieving a – 0.05% score, meaning that almost every single child in Year 11 achieved their target grades. The Barlow has responded to Governments request for all schools to encourage more pupils to study and enter pupils for the more traditional English Baccalaureate subjects of English, Maths, Science, MFL and Humanities. This year 76% of students achieved a C+ in English, 90% in French, 58% in Maths, 70% in Humanities – Geography 81% and History 62% and Science 52%. 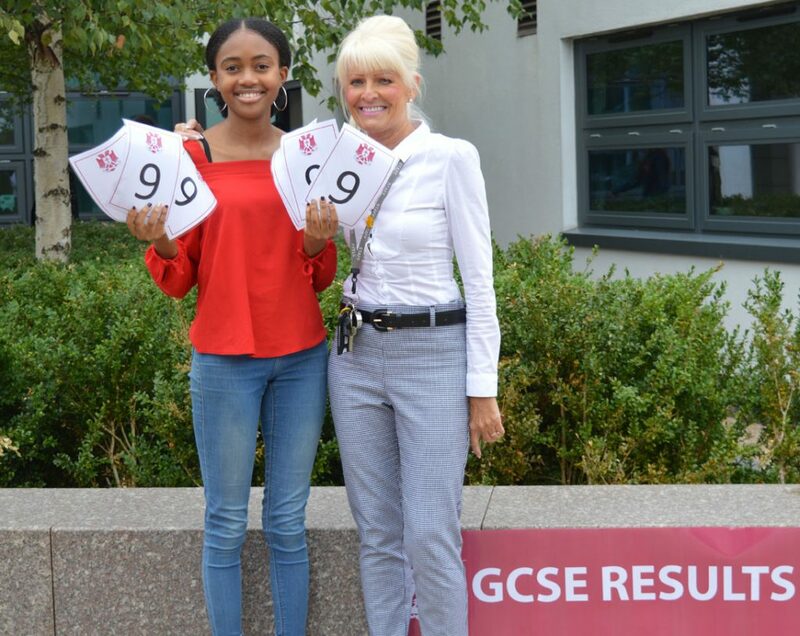 In addition as a Catholic School where all students study RE to GCSE level we are delighted that 70% of students achieved A*-C grades with 23% of these being at A* – A grades. Congratulations to Year 11, 2016 students. We wish them all the very best for their future success. “I am very pleased with my results, I did a lot better than I expected.” Scarlett Hollings, Year 11.